We’ve gathered our top seven picks to exercise in Los Angeles. It’s not everywhere in the world you can leave the hustle and bustle of the city and within an hour be surrounded by jaw-dropping natural wilderness and wildlife. Skip the gym this January, those elliptical machines are going to be full anyway. Trade in that musky gym smell for fresh air and the gorgeous California outdoors. Here are our top seven picks for the Greater Los Angeles area that give you a sense of freedom and an inspiring workout backdrop without the road trip. 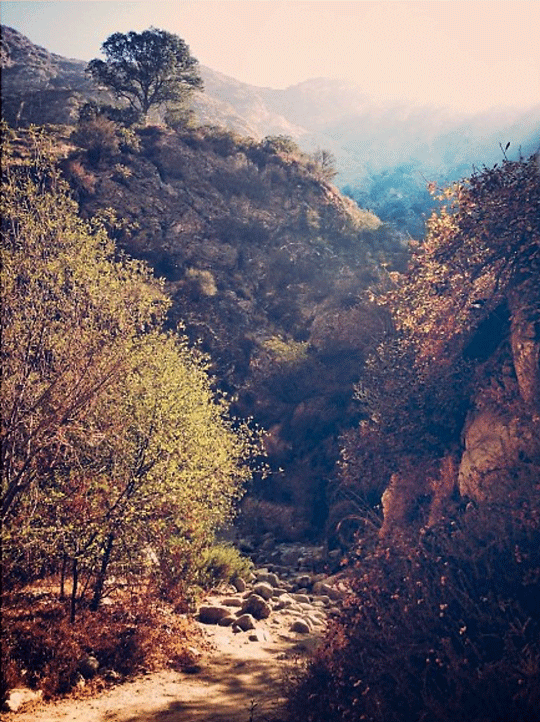 Escape the city and head to Eaton Canyon Natural Area and waterfalls. Cross streams, walk or run through rolling hills, and make sure to stop at the natural waterfall (take the left trail to find it). Find yourself with a day off during the week with nothing to do? Head to Eaton Canyon for a solo adventure. We suggest hitting the trail before 9am on a weekend to find good parking and less crowded pathways. Adjacent to the infamous L.A. Dodger stadium, Elysian Park offers panoramic views of the city to watch the sunrise, trails for running and walking, and a pathway to enjoy acres and acres of greenery. Bring the dog, pack a picnic, and invite your friends and kids of all ages! The bonus? It’s one of the few places in L.A. where parking is a breeze. Find the hidden swing near Angel’s Point for some killer ‘gram photos. Start with an intensive uphill climb (ready to burn some calories?!) and reward yourself with a good workout and stunning city views. Plenty of nature lovers and avid hikers populate the trail providing a feeling a safety and community during your hike. 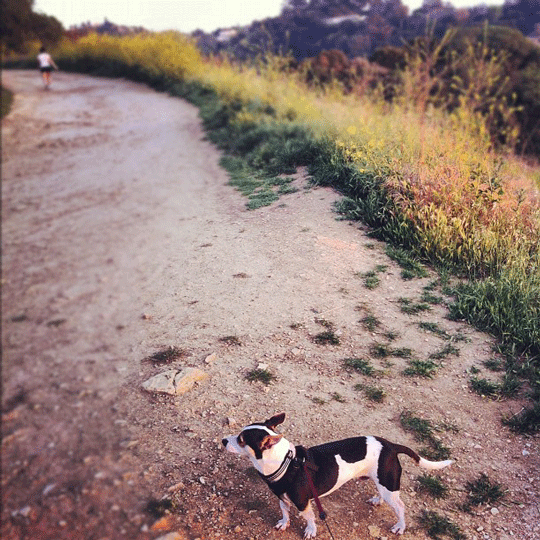 South of Studio City and West of the Hollywood Hills make this an easily accessible trail for Westsiders. Join in on the longest running yoga-in-the-park classes in Los Angeles. The perfect yoga class for people of ALL levels whether you’re a seasoned veteran or yoga newbie. Find peace and rejuvenation in this outdoor yoga class conducted since 2001. Surround yourself with the flora and fauna found in SoCal with this volunteer-based yoga class. Remember to bring your own mat or towel for practice or choose to re-center and connect your feet to the grassy earth beneath. Donation based for good karma. You’ll hear phrases to describe Sandstone Peak like “must-hike” or “the hike that got me hiking”. Catch a glimpse of the valley, Pacific Ocean, and seemingly endless mountain ranges while you reach the highest point in the Santa Monica Mountain range, over 3,000ft. Stop by Inspiration Point on the way for breathtaking views. Make sure to sign your name to summit register to record your ascent. We learned over at SoCalHiker that the Sierra Club regularly replaces full registers and sends them to Bancroft Library in Berkeley for archival. How cool would it be to show your grandkids past hikes?!? Boasting the title of one of the largest urban parks in North America, Griffith Park hosts more than 53 miles of trails and over 4,300 acres of wilderness. Escape the city without ever leaving. If you’re just getting use to the ideas of switching up your gym routine (or let’s be honest — just starting out your workout routine after the holidays) the Griffith Observatory trail is a steady incline up a 2.5-mile paved pathway leading to an expansive view of the City of Angels. Stick to the green trail markers for the easiest and shortest trails. When you’re ready to add some huff and puff to your workout go ahead and wander down the blue and red markers for moderate and strenuous trail options. Add a challenge to your next cross training routine. Unleash your inner acrobat and cross train with a front row view of the Pacific Ocean. Rope climbs, parallel bars and balance beams are just a few options in this outdoor gymnasium to get your heart pumping. Head out during the morning to find close by parking and fewer crowds. 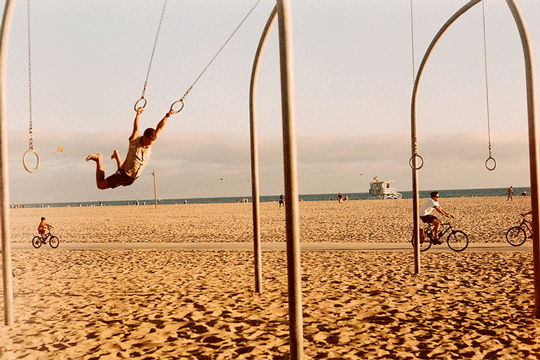 Not only will the Santa Monica Pier outdoor gym make you feel like a kid again, but they have a smaller kid’s version too! Family friendly fun? We’re in! Regulars advise bringing gloves for the slippery ropes and bars due to the morning marine layer. Whether you’re out for a stroll or up for a sweat, gslovesme.com has the athleisure wear you’re looking for this season. Here are a few of our top picks for getting out and active! Feature photo credit: Griffith Park, Tony Nungaray, Flickr.